Samaritan's Purse is helping flood victims clean and repair their flood-damaged homes in Perth-Andover, New Brunswick. The slow and painstaking work to salvage flooded homes and businesses in Perth-Andover continued Thursday, with several international relief organizations in the area to lend a helping hand. 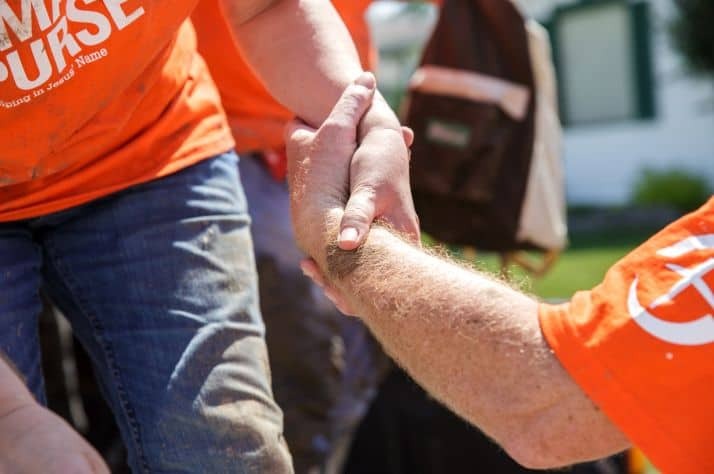 Samaritan’s Purse Canada and the Salvation Army have joined the Canadian Red Cross and local volunteers in a coordinated effort to help flood victims clean and repair their homes. Samaritan’s Purse is a non-denominational evangelical Christian organization that has been providing spiritual and physical aid to victims around the world since 1970. The husband and wife team of Stephen and Mae Joudry of Moncton, coordinators for Eastern Canada disaster relief, brought a truck and large trailer full of relief supplies to Perth-Andover. They plan to stay as long as their services are needed. “We are prepared to come in and lend whatever disaster assistance that we can,” Stephen Joudry said. Joudry said if victims need more help, the group can also provide assistance or put victims in contact with other agencies. “We are trying to mobilize the community, so neighbour can help neighbour, the churches getting involved to help the community,” he said. The Samaritan Purse equipment trailer includes generators, pumps, pressure washers, chainsaws, wheelbarrows and other cleanup equipment. The organization can also bring in loaders and wood chippers to disasters that require tree removal. Flood victims that need a helping hand from Samaritan’s Purse and volunteers who want to help can call 1-866-628-6565 for more information. Mae Joudry said a relief effort of Fredericton-area volunteers has been organized for Monday. Volunteers interested in helping with the flood cleanup effort in Perth-Andover can meet at the Long’s Creek weigh station at Trans-Canada Highway Exit 258 at 7:30 a.m., and convoy together to the village for a daylong work blitz. Hard-working volunteers and flood victims need nutritious meals, a hot cup of coffee and perhaps a kind word. Maj. Larry Goudie of the Salvation Army Corps in Fredericton is helping feed the overwhelmed and stressed flood victims and volunteers. The Salvation Army brought its disaster relief mobile kitchen unit to Perth-Andover to help feed the volunteers and families. “We thought that we could come up and give a hand with feeding those that are very involved in the cleanup. We will be here for however long they need us,” Goudie said. The mobile kitchen can provide hot meals, coffee, tea, water and juice for cleanup crews. On Wednesday the kitchen travelled door to door throughout the village, helping feed the dozens of valley firefighters who travelled to Perth-Andover to help flood victims. The Salvation Army officer said his initial reaction was property owners had suffered devastating losses in the March 23 flood, but he was inspired by the outpouring of support and assistance. “The village is overwhelmed by the flood, but they are also overwhelmed by the assistance people have provided from the province and right across the country,” Goudie said. The Salvation Army has coordinated their efforts with the Canadian Red Cross and the Perth-Andover flood relief committee.